This morning when I woke up, the view from my window was cold. Barren trees, patches of snow and a sky a single shade of white dirtied with bleak grey. Fall is over. 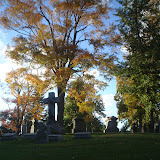 To try and combat the coming months of this cold lifelessness outside, I thought I would finally post some photos from my October cemetery outing.